Founded in 2006, Rachel’s Kitchen is an eatery that caters to offering gourmet food at affordable prices. The owner, Debbie Roxarzade, affectionately named her restaurant after her beloved daughter. With many years of culinary experience dating back to her time in Los Angeles, Roxarzade wanted to create a new vision of a restaurant that would offer people the opportunity to experience gourmet food that is accessible to everyone. From this desire, Rachel’s Kitchen was formed. It appears that people appreciate the concept of gourmet food at reasonable prices, as Rachel’s Kitchen has expanded to several locations throughout Las Vegas and Henderson, Nevada. Rachel’s Kitchen operates eight locations throughout Las Vegas and Henderson, Nevada. The specific locations and days and hours of operation are as follows. 150 Las Vegas Blvd N.
Rachel’s Kitchen serves its customers on a first-come first-served basis. The menu at Rachel’s Kitchen is made of solid gourmet cuisine that is easy on the pockets. Only the freshest ingredients are used. Many of the menu items are traditional, but they are made with considerable attention to quality. Some of the menu offerings are as follows. · Breakfast - (Served all day) breakfast wraps and burritos, grilled cheese, scrambles, French toast, pancakes, omelets, acai bowls, omelets, and more. · Soups & Salads - Soup of the day as well as several varieties of salad such as cobb, Caesar, curry chicken, Chinese chicken, signature, spinach, tuna, and more. · Gourmet Sandwiches - Smoked turkey and avocado, grilled cheese, albacore tuna salad, the 440 Sandwich, vegetarian, turkey club, soup, and half sandwich. · Wraps - Tuna, chicken Caesar, curry chicken, BBQ chicken, and chicken tender wraps. · Burgers - Turkey, cheeseburger, BBQ bacon burger, sautéed mushroom cheeseburger; served with bun or lettuce wrap and choice of side. · Pasta - Signature pasta, mac n’ cheese, angel hair Bolognese, traditional tomato basil, fettuccine alfredo, and more. · Drinks - Smoothies, fresh squeezed juices, and coffee. Rachel’s Kitchen offers convenient online ordering for pickup. Bring the deliciousness of Rachel’s Kitchen to your next event with catering services. 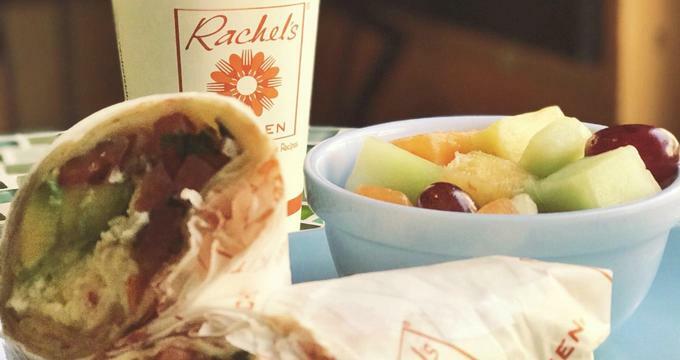 From platters to boxed lunches, Rachel’s Kitchen provides a full catering menu of both breakfast and lunch options based on the number of people served. A detailed catering menu is available at the Rachel’s Kitchen website for review. Become a member of the Rachel’s Kitchen preferred guest program and receive an assortment of perks and discounts on food. Customers can register for the program online via the Rachel’s Kitchen website.